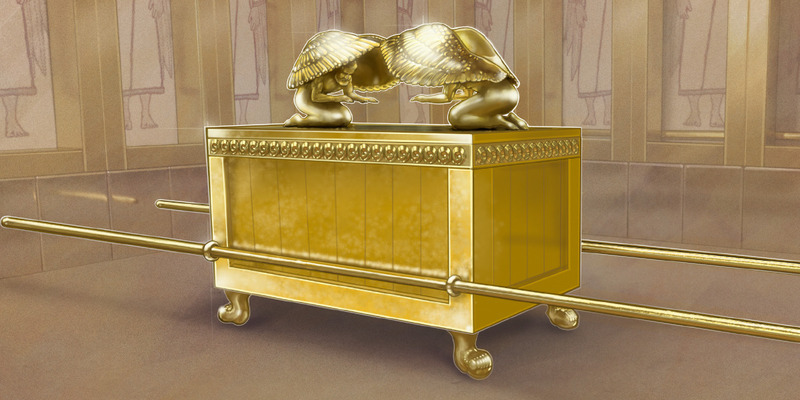 Within the veil of the Holy of Holies sat one piece of furniture, the Ark of the Covenant. The ark represented the presence and the power of Jehovah God. The ark emitted God’s glory. Inside the ark was the golden pot filled with manna from the wilderness, Aaron’s rod that budded, and the tablets of the covenant. Above the ark were cherubim of glory overshadowing the mercy seat. The mercy seat was the golden top that covered the ark. When the high priest entered the Holy of Holies on the Day of Atonement, he carried a golden censer of incense to cover the mercy seat with smoke so he, who was a sin, would not see God’s glory, Who did not sin and die. The high priest sprinkled the blood of a bull and a goat on the mercy seat for the atonement of sin. In this holy act, we see both the mercy and grace of God on display. Mercy is a Holy God withholding what sinful man rightfully deserves: eternal separation from Him in a devil’s hell. Grace is a Holy God giving the sinful man what he does not rightfully deserve: the forgiveness of sin and the right to experience and enjoy a relationship with Him in His eternal kingdom. God, in His holiness, cannot give one without the other. When the high priest sprinkled the blood on the mercy seat, God withheld what the high priest, his family, and Israel rightfully deserved: death in hell. When God accepted his sacrifice and let him, his family, and Israel live another year, God gave them what they did not deserve: an opportunity to know and love Him. Through the death of Christ, God made it possible for us to enter into the Holy of Holies without dying (mercy) and receive forgiveness (grace) for our sin. How? Christ’s death appeased the wrath of God (mercy) and atoned for our sin (grace). The apostle Paul said in Ephesians 2:4-8, “But God, who is rich in mercy, because of His great love with which He loved us, even when we were dead in trespasses, made us alive together with Christ (by grace you have been saved), and raised us up together, and made us sit together in the heavenly places in Christ Jesus, that in the ages to come He might show the exceeding riches of His grace in His kindness toward us in Christ Jesus.” Jesus is rich in mercy and grace! He has an endless supply. Have you experienced God’s mercy and grace? You have if you committed your life to His Lordship. If you have not experienced His mercy and grace, He, through an endless supply, wants to lavish both upon you. Will you allow Him to do what He died to do? Salvation is not sinless perfection on earth. No, sinless perfection occurs once we enter heaven. As believers, although we should and can resist sin, in weak moments will yield to the power of sin. When we sin, God demonstrates His rich mercy: He does not kill us, and He demonstrates His rich grace: our salvation is secure.